The Wellesley Education Foundation’s (WEF) STEM Expo 2019, which took place on April 6 at Wellesley High School, was the 4th iteration of what organizers have called "a labor of love.” The Expo was a collaboration between committed volunteers, community members, corporate sponsors, Wellesley public/private schools’ teachers and staff, exhibitors and attendees. 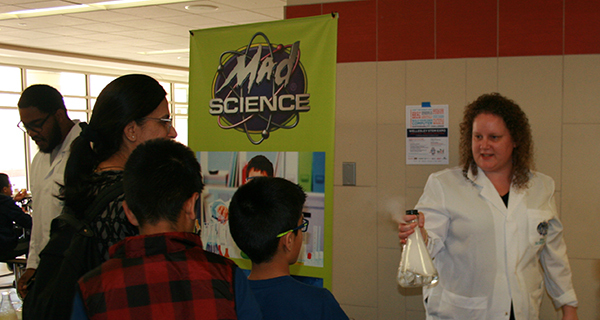 One major factor that always contributes to STEM Expo's success is that there is no entry barrier to gain access to STEM; attendees enjoy free admission, without having to meander through schools or colleges, and it's a hands-on, interactive experience for all age groups - attendees feel that this event is for them. A shared thread among many scientists is a deep sense of curiosity, and it's often the reason why they pursue STEM careers; this innate sense of curious wonder coursed through Wellesley STEM Expo and all its exhibits - in fact, it is the rationale typically cited by repeat and new exhibitors, as well as attendees, year after year. Looking at the Expo by the numbers, on Saturday, there were approximately 3,800 attendees. There were 400 attendees for the keynote speech alone, 110 interactive and engaging exhibits, 25 robots (ranging in cost from $5 to $5 million), 20 live animals, 18 exhibits organized by WPS faculty (and many with students presenting their projects), 14 schools represented (ten representing Wellesley Public Schools, Fay school, Belmont Hill, Tenacre, and St. John), 12 unique workshops that offered 26 sessions, seven exhibits organized by elementary school PTOs, five universities, four exhibits led by WHS student clubs, and three workshops led by WPS faculty. It all added up to one giant day of dazzling STEM. Furthermore, there were several lead-up events to this year’s Expo, including Wellesley Creates, Computational Thinking and the Sustainability Challenge. The winners of the Sustainability Challenge were elementary school students Elan Usmani (“Making Wellesley Lawns Greener" video), Nalini Fiorillo (“How Green Is Your Community?" infographic on school commuting), Emily Burham and Audrey Song, and Abby Brown and Kayla Bohlin (“Plastic In The Oceans" website and video). The middle school student winner was Kellen Sharpe (“Composting" video) and the high school winner was Owen Mix (“Hydroponic Greenhouse" PowerPoint presentation). “We were blown away by depth and breadth of the different science experiences there. We learned about conservation, forestry, bacteria that generate electricity, robotic surgery, all kinds of microscopy and exciting new materials and 3D printing technology,” said WMS parent Kevin Leach, who attended Expo with his son, Max. “These events really make a difference, and Max left the Expo with new, cool knowledge that continues to fuel his desire to know more about the natural world and how he can make a difference in it. We were also inspired by the willingness of all the different presenters to take part and enrich our community. Thank you again [to WEF] for coming up with this idea, coordinating the thousands of different things that have to be done, and getting it done - it was awesome". The keynote speaker, Dr. Cheryl Knott, was also a big draw for attendees. A biological anthropologist, Dr. Knott highlighted her work with the orangutans of Borneo and her pioneering efforts with respect to rainforest/habitat conservation. The Wellesley Education Foundation relayed its thanks to all those who joined them in their efforts to continue to inspire the love of learning. For more information, visit www.wellesleyeducationfoundation.org. Abby Brown, Audrey Song, Belmont Hill, Computational Thinking and the Sustainability Challenge, Dr. Cheryl Knott, Elan Usmani, Emily Burham, Fay School, Kayla Bohlin, Nalini Fiorillo, Schools, St. John, STEM, STEM Expo, students, Tenacre, Wellesley Creates, Wellesley Education Foundation, Wellesley High School, Wellesley Public Schools.